There is so much that can be said about learning to say no and how it will benefit your Artful Life. We certainly need to learn to say no to the myriad of things that bombard our time for creativity. But that is a subject for another day. Today, and in recent days, I’m learning to say no to any online activity that can rob me of my contentment in the creative work I enjoy. For me, a huge difference in Living an Artful Life as opposed to Having an Art Career, is a sense of contentment about where I am creatively, and what I’m making. When I’m in gotta-make-a-career-of-art mode, I scramble. This driven scrambling has a hunker-down feel tinged with frenzy. I’ve gotta figure out what it is I’m gonna go for, research it online, find others who are doing that, check off the list all the stuff I need to do to establish it, run around doing errands for it, etc. Living an Artful Life allows me to slow down and enjoy the creative project(s) I’m currently working on (whether they fall into any sort of career path or not), to stop fretting over whether what I’m making will sell or not, and to share what I love to do whether it’s teaching it, blogging it, or just sharing it with family and friends. I love blogging. I don’t really know why. It feels like another art form I enjoy. I also love reading/looking at other’s blogs too. And I love the whole interconnectedness we have at our disposal to see what others are creating, to learn how to make what they make, to be inspired, and encouraged. But too much of that, can creep in and dampen the joy I have in my own artistic pursuits. I may begin comparing myself to them, feeling overwhelmed that I don’t measure up, or that I just don’t know what I’m doing, or that I really should chuck all the paints and pens out on the curb. Gazing too much or for too long at others’ creative lives, can work against your own. 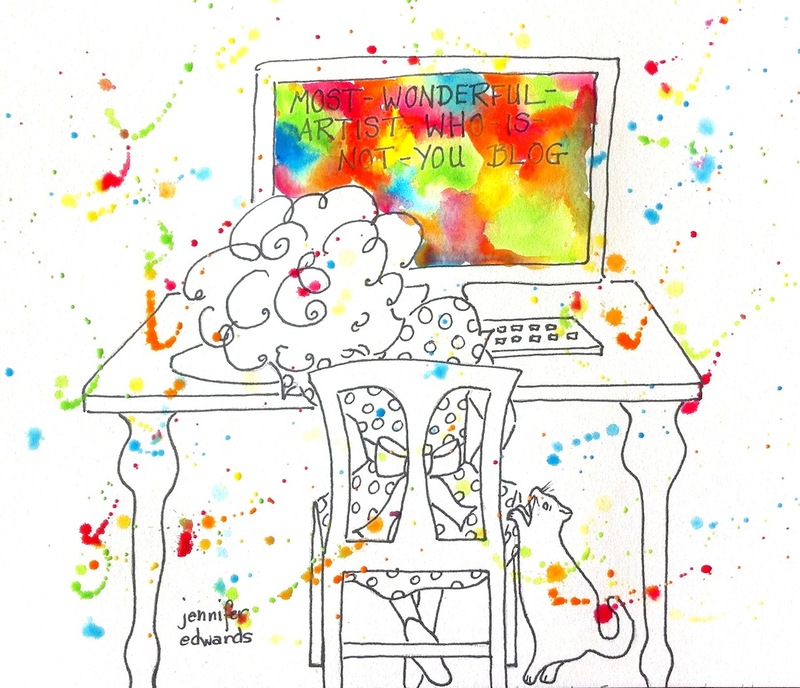 Like Genevieve, in the above illustration, you may feel like all the color has drained out of your own creative world. Ever felt like this? Part of Living Artfully is guarding the creative spark we hold in our hearts. That creative spark is a gift to be treasured and cared for. It is yours and only yours, whether it’s to begin putting pen to paper to try drawing, or whether it’s to learn a new technique in clay work, or to continue working on that mammoth fiber design you started last year. Whatever creative work you are currently into is a light that can be snuffed out by too much online activity. Not only does it eek away at the TIME you have for making, but it can dampen your joy in making it by the sheer overwhelm of just how amazing others’ creativity is! A blog gives an INCOMPLETE view of one’s life. In viewing one’s blog, (including this one:), what you DON’T see is perhaps what you need to see: the slew of interruptions, the daily to-do list, the grocery shopping, the work hours, the toilet cleaning, the disappointments, the irritations, the mental overwhelm, etc. etc. All you see is what that individual shows you…the latest painting masterpiece, the gorgeous photo of a serene (and clean) “corner” of their home, the finished knitting piece (even if it was worked on in fits and starts over the last several months or maybe even years). And if you enjoy looking at many different creative blogs, you can come away with a sense that others are just more creative than you, that they have 26 hours in their day instead of your 24, and well, they just plain “have it” and you don’t. Or it seems that way. I’m here to say to you, if you find yourself in this spot often… BACK AWAY FROM THE SCREEN! Turn it off. And when you do, pick up your current creative project or start the one you’ve been longing to begin. Gaze at it as much as you were previously gazing at the ipad screen, the computer screen, the smartphone screen. Enjoy the creative spark YOU OWN, revel in it, pay attention to it, and devote some time ( however much you can possibly give it) to doing the thing you would like to do NO MATTER whether it’s as much time as so-and-so gets to do her creativity, NO MATTER whether it’s as good as so-and-so’s, NO MATTER whether ANYONE else will like it, and certainly NO MATTER whether it’s sellable, or marketable. For some, this may require a complete shut-down of online activity for a time, or maybe for good! For others, it may be limiting your online activity to a specified amount of time, or only to a particular time of day (say in the evening when your time and energy to create is spent). Whatever it means for you to nurture that creative spark in you, do it! Whatever it is that causes you to feel badly about your creative self, stop going there! Guard your spark as if it were your child. In many ways it IS your Inner Artist Child, who wants to come out and play without any baggage hanging off of him/her. This speaks to me. There is a wonderful Christian writer that I had to stop following. I would always walk away (click away) from his blog with a feeling of worthlessness. Maybe one day I can follow him again, but not right now! So be it. 🙂 Thank you for your post! You’re welcome Alice! Thanks for sharing this! It’s funny how this practice of guarding your spark works…I feel more able to view other’s fabulous work, when I am more settled in my own creative work. Strange, huh? I hear ya! I have a few that I follow devotedly – and I find myself envying their sponsors and “likes” and followers – which is SO not the point. What I paint is the point. Oohhh…I like that Tracy: “What I paint is the point.” Yes!! True confession: I only read in here now and then! I need to have my own art energy up to where I can take it in and not be taken down. So yes I agree with you on limiting online time partly because of time constraints, partly because looking too much at other people’s art can muffle your own. What I do, though, is look at blogs, when it’s for my own purposes and not that of a couple of organizations I have responsibility for, I look when there’s a specific technique or approach I want to know more about because that’s where I am in my own work. That way other people’s art and mine work together, not against each other. And yes, we’ve agreed on this before — art is a way of life rather than a salaried job. When thoughts of marketing spring to mind before thoughts of what the work needs, then it’s a sign that things are getting off the rails. Thanks Liz, for sharing your thoughts! Good ones, for artful living! You are absolutely right Jen, we spend way too much time comparing our lives to one another and what ones does better than us. I’m letting go of some of my bloglovin’ list today and spending more time doing my creative work. Thanks for the encouragement to just “unplug” . Good advice, I need to print this off and sellotape it onto my computer screen! You’re right and I think you’ve just answered the question I asked this morning..”What’s wrong with me?” It’s not the comparison to others, for I’m healthy in my attitude about my work, but it’s the time spent looking at one screen or another and the constant looking, looking, looking instead of thinking and doing. Thanks for taking the time to share your thoughts which really mattered to me today. I’m going on a media diet starting now, choosing to read blogs that feed my soul and following people on Pinterest who create sparks. I have a feeling, Jo, that going on a media diet will allow your own creative work to grow and grow! Thanks for commenting here and sharing your thoughts! What wonderful insight. Thank you! Just what I needed to read today. You’re welcome Jan! Glad you stopped by for a visit! The people sending the emails are making tons of money from the $$ you send for the privilege of seeing if you are good enough to be included and the people who will probably see your work if you are, are other artists. Not to mention the time you will spend preparing something to enter. JUST SAY NO to about 90% of the things you think you just can’t pass up and you will have a happier creative life! Cheryl! We so need to be focused in how we share our art and where it gets seen. Grest advice for artists! Hope you are doing well! LOVE this post and I’m going to save it for future reading. Balance…. we all need balance in our lives. And.. I know for myself…. I’d have a lot more to show if I did art rather than look at art. It sometimes feel like art crack to read other people’s blogs (art and lifestyle), but maybe it’s just a fear of failure or procrastination to show up at my own art table. It’s fascinating and overwhelming to see and hear everyone’s viewpoints. . . but, if I hadn’t read this post, I wouldn’t have been so aware of my need to stay in balance. . . .and why I feel a bit jealous/envious/defeated when I read too many blogs. I guess balance and making sure you show up for yourself , first, is perhaps the most important take-away lesson. Thank you Jen and everyone for teaching me a valuable lesson. And thank YOU Lisa, for visiting my blog and taking the time to share your thoughts! I’m glad this was encouraging to you! This is the second post I’ve read today (after getting back home from Kingman AZ where we are trying to finish up the sale of our old house and the internet is almost non-existent) about not getting lost in the blogs and comments to them. It is something very common it seems for us to do and I really like Lisa’s way of saying it’s “like art crack” because that’s just what happens to me. I get on to do something and next think I know a couple hours have gone by as I go from link to link to link….and get nothing done for myself. Another thing that robs us of time is taking classes. That is another form of “art crack” and one I am weaning myself off of. That one not only takes your time but your money! I have enough supplies, I have enough basic knowledge and I am creative enough to “just do it”. I don’t need another class, another new supply or more inspiration from yet another blog (I will keep a few of my favorites though). What I need is to stop and just do! And I love your drawing as that is how I feel when on this merry-go-round. I feel like I am drained of all the color while everyone else has it in spades! Thanks yet again for another great post.